The recurring Pirelli tyre failures that have now once again posed an obvious safety hazard for drivers at Silverstone has led to many drivers outing their public concern, stressing that something needs to be done about it. The BBC confirmed that after the British Grand Prix a meeting was taking place between Jean Todt, Charlie Whiting and Paul Hembery to discuss the current tyre situation. The first half of the British Grand Prix was particularly dominated by 3 left rear tyres disintegrating on the rim at high speed. First Lewis Hamilton suffered a failure while leading the race, followed by Felipe Massa spinning off following a similar failure and then Vergne's left rear fell apart on Hangar straight. Later on in the race, Sergio Perez also had another tyre failure after he already had a similar problem in FP3 on Saturday. The first stops triggered teams to put higher air pressure into the tyres, but at least for Sergio Perez that strategy didn't appear to work. It is still unclear whether the problems were caused by curbs, but it seems to be more of a structural problem with the tyres rather than anything else. 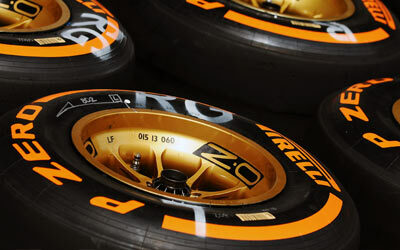 The curbs in question have been around in F1 for several years, and only now have they become a problem for the tyres. Several drivers were particularly explicit about the problems. Lewis Hamilton stressed "something clearly needs to be done, this is not safe anymore. This is a circuit with high speed corners and it could be a real problem". Jenson Button added: "You don't want pieces of rubber with metal in them to hit your helmet". One example of this is Kimi Raikkonen who was driving closely behind Jean-Eric Vergne when his tyre blew up. Parts of the tyre hit his helmet, but fortunately he was unharmed and could safely continue the race. Even team principals were pretty clear after the race that something needs to be done, with Horner and Lauda suggesting it is perhaps better to revert to the 2012 tyres. Adrian Newey was more sensible, suggesting that perhaps now is the time to allow Pirelli to introduce tyres with its new kevlar carcass after that introduction was blocked by some teams earlier in the season in fear of suffering a competitive disadvantage. UPDATE: Joe Saward has reported that Jean Todt has told Pirelli to be in Paris on Wednesday this week for a meeting of the Sporting Working Group, in order to take measures to avoid a repeat of the tyre problems that were seen at Silverstone. Pirelli has been asked to propose a solution. The FIA’s priority is, obviously, driver safety, and a suitable solution is deemed to be needed as soon as possible.